Gene Sogioka’s watercolor painting “The FBI” depicts the constant surveillance of Japanese Americans, regardless of how they behaved. The first element that pops from the artwork is the four men. The brown shirts or coats resemble the typical prison like uniform, making it clear that that they were dressed for the internment camps. Judging by their facial appearance, they seem to be relatively old, and likely members of the “Issei,” or first generation immigrants. One of the men is facing towards the stationary green FBI vehicle, while the other three men seemed concerned and talking among themselves. The leads the viewer to sympathize with the scrutiny faced by these men, and wonder whether they would suffer through this treatment or plant action for the future. The FBI agents’ faces were blurred, making it difficult to discern if they are simply monitoring the Issei or there to arrest them for perceived “crimes”. The FBI arrested over 1,200 Issei men: businessmen, Buddhist priests, Japanese language teachers, and other community leaders. Judicial cases in internment camps were given individual legal review, but in practice many Issei were imprisoned without actual evidence of posed threat to national security. Eventually, the majority of them were re-released to the WRA or to U.S. Army Internment camps. 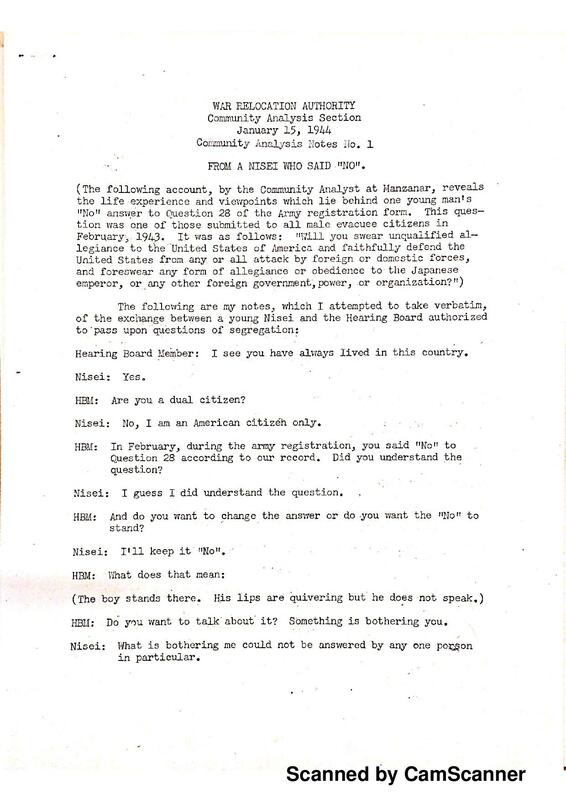 This document first details an interview occurring between a War Relocation Authority (WRA) hearing board and a young Nisei at the Manzanar internment camp in California over his refusal to swear allegiance to the United States on an Army registration form. The interviewers express their concerns with his refusal, but are unable to extract any information beyond his view that American society is unable to accept his people. What follows is a formal statement written by the Nisei, detailing his intense frustrations with the treatment that his family and friends have received as a result of wartime suspicion of the Japanese in America. He tells of his family’s forced removal from their home and explains in detail how the unfairness perpetuated by U.S. policies during WWII led to his “No” answer on the registration form. Nisei who refused to pledge allegiance became known as “No-No Boys,” and were often removed from their camps and sent to Tule Lake, which had heightened security and surveillance1. This refusal to adhere to the expectations of wartime America showed the Japanese’s political resistance which could arise when certain moral lines were crossed. Niiya, Brian. No-no boys. (2013, March 19). Densho Encyclopedia. Retrieved 14:07, November 23, 2015 from http://encyclopedia.densho.org/No-no%20boys/. During World War II, the United States government formed the War Relocation Agency (WRA) in 1942 to handle the forced relocation and detention of over 110,000 Japanese Americans from the West Coast1. The order was met unhappily, and some attempted to resist incarceration by physically fleeing, including the former Disney animator, Gene Sogioka. He and his family attempted moving numerous times, fleeing areas the US government enforced internment of Japanese Americans, even spending a month hiding in nearby canyons. However, even that was futile, as he and his family were finally discovered and sent to the Poston camp2. 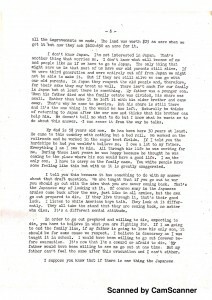 In an attempt to determine the loyalty of those interned as well as possibly identify Nisei loyal enough for drafting, the WRA distributed a form titled Statement of US Citizenship of Japanese-American ancestry to all male evacuees aged 17 or older. Questions 27 and 28 on the form caused particular distress. 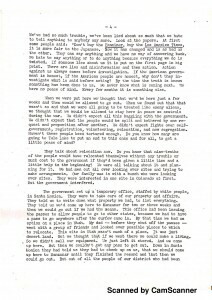 The Nisei requested clarification of their citizenship rights, complained about the segregated combat team created for Nisei, and refused to fill out the form until complaints and demands for a full restoration of citizenship rights were met. These efforts were only met with threats from the WRA, who stated that Nisei who refused to comply would be prosecuted with violating the Espionage Act. Still, as a form of protest many young boys answered no to both questions. Known as “no-no boys”, these young men believed that their constitutional rights had been violated and refused to change their answer to Question 28 because of their treatment by the US government. Many were branded as “disloyals” and were relocated to the Tule Lake camp. The Issei also resisted by protesting to the WRA until question 28 was changed to better suit the older generation’s situation3. Over 12,000 men, women and children branded as “disloyals” were moved to the Tule Lake camp, but only 6,500 “loyals” were relocated from Tule Lake. The transfers were dissatisfied with their conditions, but despite voicing their concerns, conditions did not change. By November of 1943, tensions had run high and after a series of incidents including work injuries, labor strikes broken with “loyals”, and protest demonstrations, Tule Lake was put under martial law. Although it ended in January of 1944, this period left many with a feeling of dissatisfaction and unrest. When the government daringly sent draft notices to Nisei afterwards, many were put on trial for failing to report for their physicals. Their refusal to obey the draft notice was upheld by a US district judge and the resisters released back to their families in Tule Lake4. The resistance by Japanese Americans during WWII occurred in a variety of ways, expressing their indigence of the treatment they received from the US government. The feeling of injustice persevered long after they were released and persists to this day. Robinson, Greg. War Relocation Authority. (2015, May 6). Densho Encyclopedia. Retrieved November 29, 2015 from http://encyclopedia.densho.org/War%20Relocation%20Authority/. Wakida, Patricia. “Gene I. Sogioka.” (2015, January 14). Densho Encyclopedia. Retrived November 29, 2015 from <http://encyclopedia.densho.org/Gene%20I.%20Sogioka/>. On December 7, 1941, the Japanese navy launched a surprise military attack on the United States Naval base located on the Hawaiian island of Oahu. The strike was meant to neutralize the American fleet in the pacific, but became the impetus for America to join the Second World War, and increased growing feelings of distrust and resentment towards Japanese Americans. A state of Martial law was declared at 11:41 AM. On February 19, 1942, President Roosevelt signed executive order 9066, which forced all Japanese Americans into internment camps, regardless of citizenship. 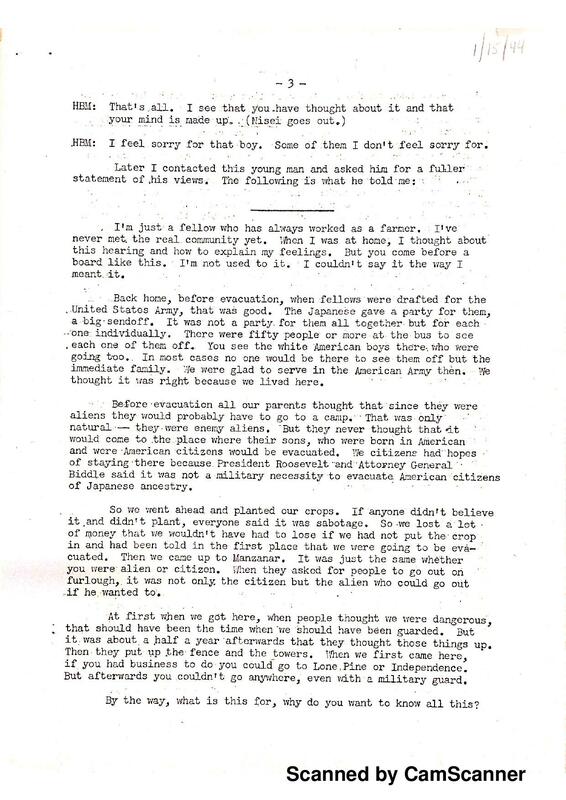 After Pearl Harbor, being of Japanese descent classified one as 4-C: “enemy alien”. Resistance to this act, and the interment was mixed. Some Nisei (Second generation Japanese immigrants) resisted, even renouncing their American citizenship, while others joined the US armed forces. Gene Sogioka’s “FBI” painting, and the testimony of an unknown Nisei illuminate aspects of Japanese American resistance against the Federal government, and much can be learned from the record of their actions. An analysis of these two texts within the overall context of Japanese internment yields valuable insight into the Nisei experience during World War II. The War Relocation Authority was created on March 18, 1942 to care for the 110,000 Japanese removed from the West Coast by the United States military. The agency built and ran a network of camps to confine and detain Japanese-Americans. The WRA’s goal was to set up functioning—though isolating and restrictive—communities. They established educational programs, recreation facilities, and newspapers. When the War Department declared that Nisei were eligible to enlist, the WRA aligned itself with the military. 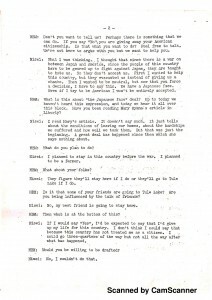 The original Loyalty Questionnaire was misleadingly titled “Application for Leave Clearance” and was intended to segregate “disloyal” Japanese Americans. It was an attempt to measure the amorphous concept of loyalty and identify trustworthy Nisei for military drafting. Questions 27 and 28 on this form were especially noteworthy. 27 read: “Are you willing to serve in the Armed Forces of the United States on combat duty, wherever ordered?,” while question 28 pressed inmates to “swear unqualified allegiance to the United States of America…and forswear any form of allegiance or obedience to the Japanese emperor, or any other foreign government, power, or organization.” Almost all who filled out the form responded positively to questions 27 and 28, but those who did not were labeled “no-no boys” and barred from resettlement. The men over the age of seventeen that answered no, or gave qualified answers to questions 27 and 28 of the loyalty questionnaire were branded as “No-no Boys” and segregated from the rest of the population at the Tule Lake internment camp. Interpretation of questions 27 and 28 caused distress amongst interned persons and led to negative answers. For the Issei, saying yes meant giving up citizenship to Japan, the only country that provided them any rights. Saying yes could also mean becoming country-less all together. For the Nisei, saying yes might imply that they had previously been loyal to the Japanese emperor. Many were offended at the implication of loyalty to a country they had never even set foot in, much less felt allegiance to. For question 27, men feared that answering yes would mean volunteering to serve. The No-No Boys—those that answered no to both questions—are often conflated with Japanese American draft dodgers, even though they were sent to different places and draft dodgers often answered yes to both questions on the loyalty questionnaire. Some Nisei found it difficult to pledge their lives to the U. S. military after having been so mistreated during the internment process. 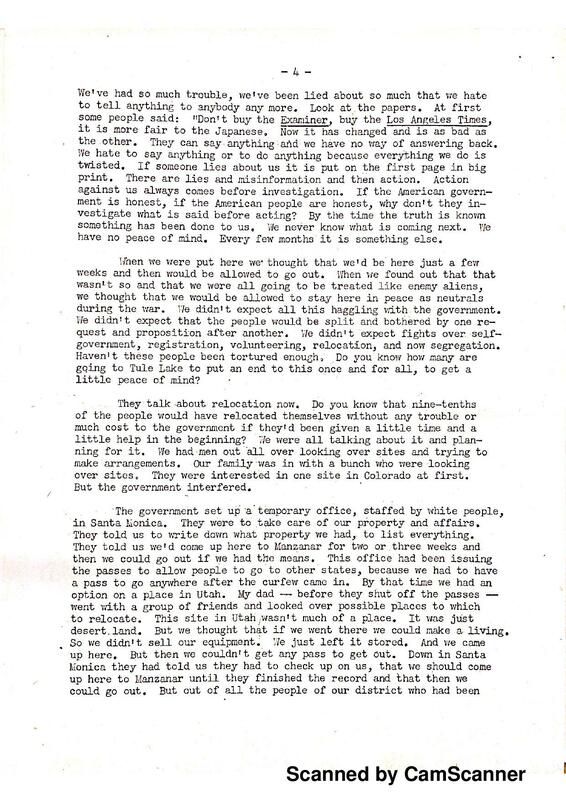 Nisei had at first attempted to request clarification of their citizenship rights, complained about the segregated combat team created for Nisei, and refused to fill out the form until complaints and demands for a full restoration of citizenship rights. Efforts were only met with threats that Nisei who refused to comply with the selective service process would be prosecuted with violating the Espionage Act. Still as a form of protest, many young boys answered no to both questions, objecting to pledging their loyalty to a country that had not treated them with dignity and respect. 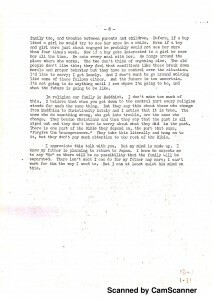 The document titled “From a Nisei Who Said ‘No’” provides an excellent case study of the feelings and actions of a young, suppressed Nisei who decided to become a No-No Boy. It also provides insight into the WRA members’ thoughts and suspicions. 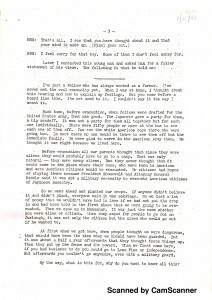 The unnamed Nisei’s written statement describes the sharp decline of his opinions on the American people as the events of WWII unfold. He was originally happy to be asked to serve in the U.S. military, as he was exclusively American and willing to protect the nation he had lived in his whole life. However, after his family was removed from their home and had to abandon the crops they planted that season, he realized that the American government had no consideration for the well-being of Japanese Americans. 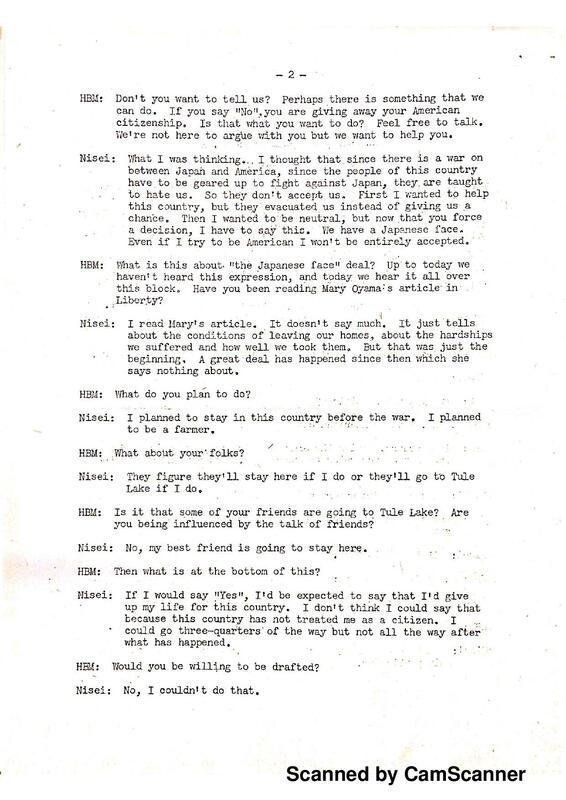 The Nisei’s timid responses to the WRA board’s questions shows that he was not being aggressively outspoken in his refusal to answer “Yes” to Questions 27 and 28, but rather could not morally bring himself to pledge his allegiance to the nation that had turned its back on his people. His form of resistance was relatively passive, but it was necessary for him to respond no to questions 27 and 28 after a clear moral line had been crossed by the U.S. government. The WRA board members’ responses to the Nisei’s statement reflect a common American shortcoming: seemingly well-intentioned but loaded with unreasonable suspicion. 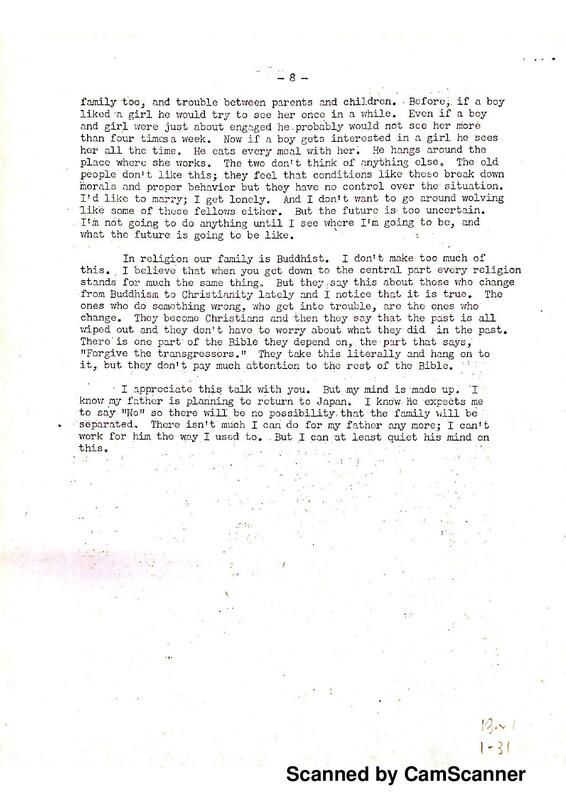 While continuing to state that they are, “… not here to argue with you but we want to help you,” the board threatens to revoke the Nisei’s American citizenship if he does not change his answer. They also continuously question whether or not the Nisei has been influenced by newspaper articles or his friends, refusing to accept that his resistance would originate from his own personal beliefs. 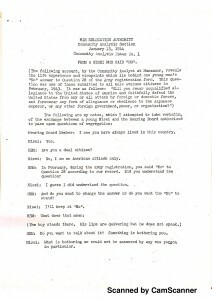 The WRA board’s lack of empathy with the Nisei’s situation prevents them from having any constructive conversation with the Nisei about Japanese opinions on internment. “From a Nisei Who Said No” gives some insight into how Japanese resistance could occur even on an individual scale. The Nisei risks losing his family and his citizenship to make this moral stand against unfair government requests, yet giving his perspective has almost no impact on the opinions of the WRA board members. However, his steadfastness in this decision shows the commitment to the personal morals and the pride of their culture which Japanese Americans held on to, even during this oppressive era in American history. Gene Sogioka is representative of physical resistance to the internment camps, resignation to an assigned role, and lastly subtle resistance through approved action. He was born in Irvindale California, on December 21, 1914. 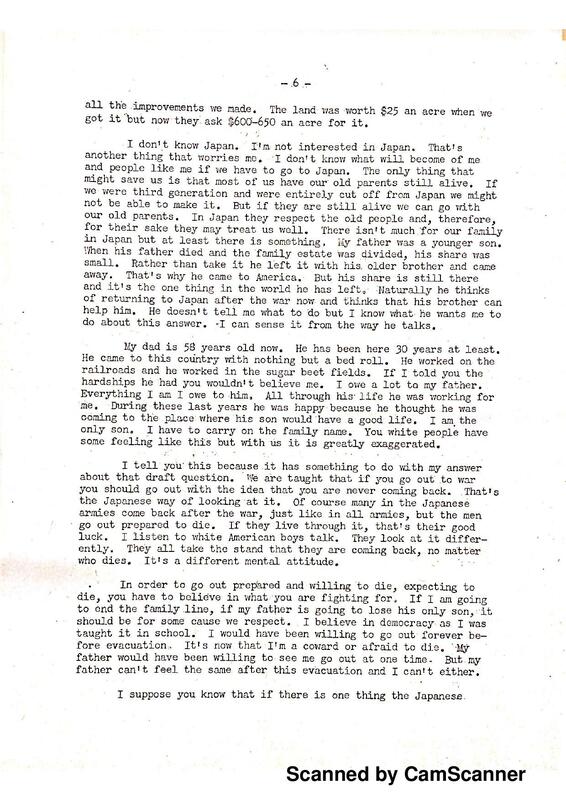 His family took him to Japan to be raised in outside of Hiroshima until he was 14 years old. He returned to the United States, graduated from Covina High School, and attended Pomona and Choinard Art Institute (now the California Institute of Fine Arts) and graduated in 1938. He became a background artist and animator for Disney Studios, working on Fantasia, Dumbo, Bambi and several other short animated films. He remained at Disney until 1942, when Executive order 9066 forced him and his family into internment camps. Sogioka’s daughter was born in January 1942. This encouraged Sogioka and his family to move inland to avoid mass removal. When the army decided to remove Japanese Americans from Military Area 2 as well, Sogioka moved his family again to Sanger, California. He spent the month of June hiding in canyons to avoid internment. He and his family were eventually found and sent to a camp in Poston, Arizona. During his two years of internment, he created over 150 watercolor paintings depicting life at the camp, under commission by Dr. Alexander Leighton. In 1980, 130 of his watercolors were found in an attic in Ithaca, New York. Sogioka’s painting “The FBI” showcases his minimalist style and desire to capture everyday moments of life in the Japanese internment camps. However, this specific painting eludes to the fear of constant surveillance created within detainees. The men in the foreground of the painting have expressions of anguish and frustration, indicative of the rising tensions between the Japanese and the WRA. The car in the background contains the shadowy faces of FBI agents, who are clearly watching the group of Japanese men. This reflects the lack of communication between the camp administrators and detainees. Sogioka accurately depicts this dichotomy, which resulted in political and physical uprising of the Japanese against the internment camps. This watercolor provides an interesting study in the distinction between Issei and Nisei. The subjects of the painting are Issei, and it is clear that they are disturbed with the current state of affairs. 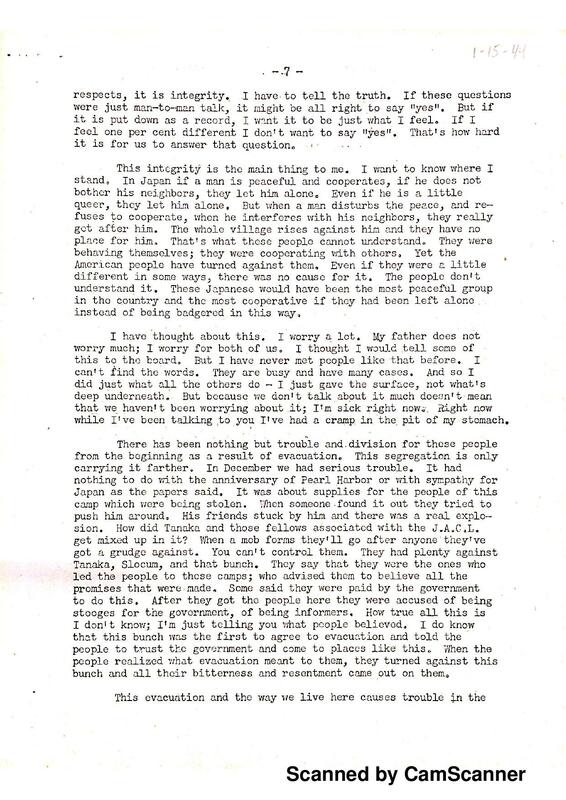 However, Sogioka was a Nisei, and may have been projecting his own opinions of the FBI and surveillance in the camps. 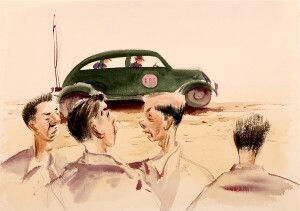 This would be a reflection of his earlier beliefs since, despite collaborating with the WRA through his watercolor commissions, Sogioka had rebelled against the government by fleeing capture and internment. His paintings may serve as an outlet for his true feelings, but many Nisei were more complacent with WRA policies, as they felt their American citizenship gave them an obligation to uphold. The Issei were more likely to be resistant to strict enforcement, as they felt less of a connection to the nation than their children due to lack of citizenship. Regardless of Sogioka’s true intentions, “The FBI” provides a commentary on the frustrations of Japanese detainees towards surveillance that may have served as a potential stimulus for resistance against the WRA. The Japanese attack on Pearl Harbor ignited latent anti-Japanese sentiment and with executive order 9066, over 100,000 Japanese Americans were removed from their homes by the WRA and transferred to internment camps. Resistance to removal and internment is essential to the Japanese American experience during World War II. This came in many forms, both actively through refusals and protest, and passively through art and writing. 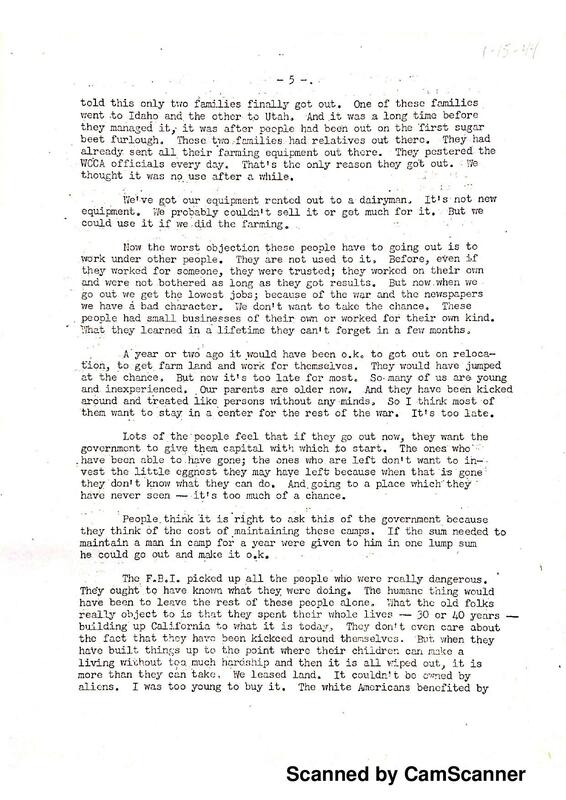 These are exemplified through Gene Sogioka’s flight from the authorities, and his depiction of disturbed Nisei, as well as changing (and ultimately more negative) opinion of the American Government espoused by the unnamed Nisei. Sogioka’s watercolor and the primary document lend important insight to our understanding of resistance Japanese internment in WWII. They do not simply give us information, but illuminate the personal experiences of those affected by this massive tragedy and expose us to the personal reality of internment. It is important for these personal instances of resistance to live on in the historical record of the camps. It shows the strength of Japanese Americans in the face of oppression and the severity of the crimes committed against them. Harth, E.. (1997). 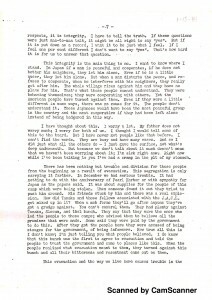 REPORT FROM THE HOME FRONT: Working for the War Relocation Authority.Soundings: An Interdisciplinary Journal, 80(2/3), 389–407. “Loyalty: The Questionnaire.” A More Perfect Union: Japanese Americans & the US Constitution. http://amhistory.si.edu/perfectunion/non-flash/loyalty_questionnaire.html. Lyon, Cherstin. Loyalty questionnaire. (2014, May 12). Densho Encyclopedia. Retrieved 21:00, November 29, 2015 from http://encyclopedia.densho.org/Loyalty%20questionnaire/. Mura, D.. (1993). No-No Boys: Re-X-Amining Japanese Americans. New England Review (1990-), 15(3), 143–165. Nakamura, Kelli. December 7, 1941. (2015, June 10). Densho Encyclopedia. Retrieved 18:56, November 29, 2015 from http://encyclopedia.densho.org/December%207,%201941/. Omatsu, Glenn. Journal of American Ethnic History2 (1989): 159–161. Robinson, Greg. War Relocation Authority. (2015, May 6). Densho Encyclopedia. Retrieved 20:06, November 29, 2015 from http://encyclopedia.densho.org/War%20Relocation%20Authority/. SCHAFER, P.. (1943). 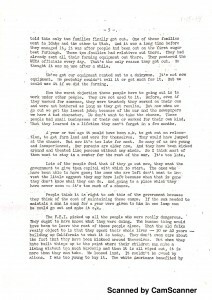 A WAR RELOCATION AUTHORITY COMMUNITY. The Compass, 25(1), 16–19. Wakida, Patricia. “Gene I. Sogioka.” Densho Encyclopedia. 14 Jan 2015, 19:53 PST. 23 Nov 2015, 17:49 <http://encyclopedia.densho.org/Gene%20I.%20Sogioka/>. Wax, R. H.. (1987). In and Out of the Tule Lake Segregation Center: Japanese Internment in the West, 1942-1945. Montana: The Magazine of Western History, 37(2), 12–25. Kelli Nakamura. December 7, 1941. Densho Encyclopedia. “Loyalty: The Questionnaire.” A More Perfect Union: Japanese Americans & the US Constitution. Brian Niiya. No-no boys. (2013, March 19). Densho Encyclopedia. Patricia Wakida. “Gene I. Sogioka.” Densho Encyclopedia.